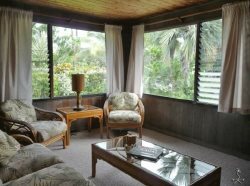 Our beach houses put you right in the heart of Hanalei Bay. The 2-mile-stretch of stunning beachfront features a sandy bottom and tropical reefs at both ends. The historic one-lane Hanalei Bridge crosses over the idyllic Hanalei River to the unforgettable, beautiful, somewhat hippie enclave of HANALEI BAY. An island paradise enriched with timeless beauty, where lush green mountain peaks rise up from the sparkling blue waters of the bay, the rolling waves tumble onto pristine white sands and the craggy peaks of the Wainiha mountain range and Makana, famously known as Bali Hai from the 1957 movie South Pacific, stand tall in the distance dotted with waterfalls. Pack your beach bag and switch to island time as we explore the beaches of Hanalei Bay, a jewel in the crown of Kauai’s North Shore, a space perfectly placed between the ocean and the sky. The crescent-shaped Hanalei Bay is one of Hawaii’s most scenic beaches. A long sandy coastline, home to three beach parks scattered with coral reefs and perfect point breaks. Yachts anchor in the bay, rivers join the ocean and waterfalls flow from the lush green cliffs. The winter months bring swell to the bay drawing surfers from all over the world to ride the waves. The breaks of the eastern point connect to become one of the longest rides in Hawaii and the Hanalei Pier provides shelter for beginner surfers. In the summer the bay is calm, often lagoon-like and the two miles of sand and shoreline offer plenty of room for everyone to play, whether swimming, surfing, sunning or kayaking the Hanalei River. A local favorite and family-friendly beach, BLACK POT BEACH PARK, borders the mouth of the Hanalei River at the base of the Hanalei Pier. Rent a surfboard or paddle board to test the waters, head up the river on a kayak, or simply take in the beauty of mother nature. Black Pot Beach has some calmer surf close in among the wild North Shore swells, however, the river makes a rip current, which is common in the winter. Picnic on the grass lawn in the shade of the Ironwoods or stand up paddle on the calm waters of the HANALEI RIVER. PU’U POA BEACH is at the East end of Hanalei Bay. You can cross the Hanalei river mouth in the summer from the rest of the bay. Accessible year-round via a cement path with over 200 steps next to the St. Regis Hotel in Princeville, this is a beach with stunning views. You are closer here to the 3 breaks that line up when the winter swell direction is just right to create the best surf rides on Kauai, which Hanalei is famous for. The surfers usually paddle out from Black Pot but there is a back door channel here too which has a small area with okay snorkeling in the summer. Lush green mountains from Hanalei to Wainiha & Makena (Bali Hai) are the backdrop of the Hanalei Bay and surf view. A bonus - if take a credit card with you, can get a fancy tropical drink and food at the pool bar of the St. Regis. An expensive but a fun rest stop in the middle or at the end of a long beach walk. HANALEI BEACH PARK PAVILION almost always has life guards and is to the right of the center of Hanalei Bay and the Kobayashi Beach Houses. The waves tend to be easier here for beginners and kids. WAIOLI BEACH PARK, also known as Pine Trees, has surfers and body boarders are plenty. It is a sandy bottom break. A shady part of Hanalei Bay, Pine Trees has a large grass lawn and two volleyball courts for fun beach action. MIDDLES is just to the West of Waioli Beach Park. Just past the Waioli River mouth and out in the middle of the bay is Middles surf break. The beach here tends to be quiet with few people. For more peace and tranquility head west to the very end of Hanalei Bay to the secluded WAIKOKO BEACH. A steep climb down from the highway, Waikoko Beach is rarely crowded. The waters tend to be choppy with strong riptides, undertows and sharp rocks and sea urchins, however, the pretty shallow lagoon is a great place for the kids to play. You can look straight across Hanalei Bay to Princeville and Puu Poa Beach. You can walk to any of these beaches from the Kobayashi Beach Houses in the summer. Just don the sunscreen and take your hat & water. Traveling east from Hanalei Bay towards Princeville there are many other beautiful beaches to discover. HIDEAWAYS BEACH is a secluded cove of golden sands and turquoise waters, a secret North Shore gem. A steep path leads you to a piece of paradise where sea turtles bask in the sun and beach lovers relax in the shade of the false Kamani trees. QUEENS BATH is gorgeous in the summer if there are no waves and you can manage the steep and treacherous journey along lava rocks down to the pool. There is no beach here, simply a spectacular natural pool surrounded by a lava shelf where fresh saltwater and marine life streams in from the ocean. The algae attract the sea turtles, a pure delight to watch, however, heed the many warnings, the waves crashing into the pool are highly unpredictable. A family favorite is most definitely ‘ANINI BEACH PARK. Protected by one of the longest reefs in Hawaii, the waters are calm, there’s plenty of shade and you can try windsurfing. It is a great place for the kids in the winter when the other beaches are too rough. There are schools of tropical fish along the inside edge of the reef. The white sands of nearby KALIHIWAI are surrounded by lava cliffs and Ironwoods, at the mouth of the Kalihiwai Stream. This protected bay promises surfers an epic surf right off the beaten path in the winter and a calm bay in the summer, with shady sands and a freshwater stream for swimming. If you are looking for something more remote, SECRETS BEACH is it! Crystal clear deep waters extend for more than a mile. It's not for swimming, but it's great for walking and taking in spectacular views. The famed Kilauea Light House and islands are at the east end of the beach. A word of caution, it tends to be clothing optional. Traveling east from Hanalei Bay are even more North Shore gems! Passing through Waikoko, you reach the shores of LUMAHA’I, made famous by the movie South Pacific. One of the most photographed beaches in Kauai, back dropped by rugged lava cliffs. The waters here are unsafe for swimmers however it is an awesome walking beach. Nuses' Cove at the east end is exceptionally pretty. You may feel you have reached heaven on earth when you reach the shores of the iconic TUNNELS BEACH, a picture perfect stretch of sands and tropical palms. A favorite amongst divers, snorklers and surfers with an inner and outer reef and underwater caverns. Parking is scarce, so plan to park at HA'ENA BEACH PARK, where the jungle meets the ocean. Walk back to the right to reach the snorkeling area. A popular-but-dangerous surf break is on the outside reef. Keep going to the end of the road. This brings you to the enchanting Na Pali Coast, where coconut palms and kukui trees mark the trailhead of the 11-mile Kalalau Trail at KE’E BEACH. An abundance of marine life makes this is a great spot to snorkel when the waters are calm. Spectacularly scenic, however, don’t be fooled by the calm waters, when the waves are on the outside, the undercurrents can be strong here. There is usually a lifeguard on duty here. Nestled along the Kalalau Trail 2-miles into the hike is HANAKAP’AI BEACH. By far one of the most beautiful trails in Hawaii, however crossing the stream to get to the beach can be very dangerous due to flash flooding, even when you don't see any rain. There is no lifeguard at this beach and the surf has strong undertows and currents. That being said, the trail is still worth it even if you never get to the beach. Just going up to the first point where the picture above was taken from is inspiring. Beach safety on Kauai’s North Shore is imperative! The ocean conditions are forever changing. Strong waves and riptides form without notice. If you are heading into the water, choose a beach with a lifeguard and read warning signs carefully.